RARE OPPORTUNITY - Fantastic, spacious detached Villa set in a peaceful corner location on Phase I, 3 bed, 2 bathroom bungalow with the accommodation all on one level, surrounded by private gardens & terraces with space to add a private pool if desired. UN-FURNISHED – Kitchen Complete with White Goods! Just a gentle walk to the nearest bars and restaurants. Centered on a manageable sized plot here at Hacienda del Alamo in a much sort after corner location with open views this Vega style villa offering ample family sized accommodation would be just perfect for family holidays and equally, great for year round living. Beautifully landscaped plot, low maintenance using an abundance of sub-tropical trees and shrubs to create an oasis within an oasis, space to add a large private swimming pool with excellent privacy and a multitude of areas offering as much sunshine or shade that you could desire. Recent addition of a wooden storage room, this is a very useful addition and ideal for bikes and clubs etc. Access to the property via concrete drive way or natural stone pathway to a cover entrance porch, hardwood panel door opens to the combined lounge and dining area with feature ceilings as a center point to the property, a fully fitted kitchen is showcased in the dining area. Full range of kitchen units and appliance's with granite work surfaces, a very usable space whilst entertaining or looking after the family. All of the accommodation is on one level, the Master bedroom suite boasts a private en-suite shower room whilst bedrooms 2 and 3 share a family bathroom. Access to the beautiful covered terrace via the dining area or kitchen doors naturally extends the living area, the open views extend over the garden, ideal for sunny lunches in the shade! The Vega style villa has an internal courtyard with external stairs leading up to another covered terrace. The nearest bar and restaurant is just a short, 2 minute stroll away. A popular choice of house style for many here at Hacienda del Alamo, this Vega with an official constructed area of 132sqm feels much bigger as the Southerly orientation allows the light to enter the villa on several levels, whilst the outside space offers the possibility of bringing the outside in! From the galley style kitchen, glass panel door to covered drying area, with direct access to the drying area with tiled floors, wooden shed, just perfect for additional storage! Sheraton Hotel and Spa will be open in August 2018 bringing a much need International Window to showcase The Resort of HDA. Boasting stunning views across HDA's Championship Golf, from the back ties one of the longest courses in Spain, the 5* Club House as the center point to The Resort is a fantastic place to enjoy a relaxed lunch in the 'a la carte' restaurant or grab a hearty English breakfast or bar snack before Teeing off. Summer evenings watching the sunset from the large terrace over the distant mountains of the 'Sierra Espuña' with a sun downer and sampling the freshly prepared local products is an absolute must! Karine and Simon have lived and worked here in Spain since 1997, having transferred from the hectic Hyatt Regency Hotel at Charles de Gualle in Paris to the then, Hyatt Resort Hotel, La Manga, both within a matter of months had decided that Murcia and The Costa Calida were the ideal place for them to settle down and raise a family. 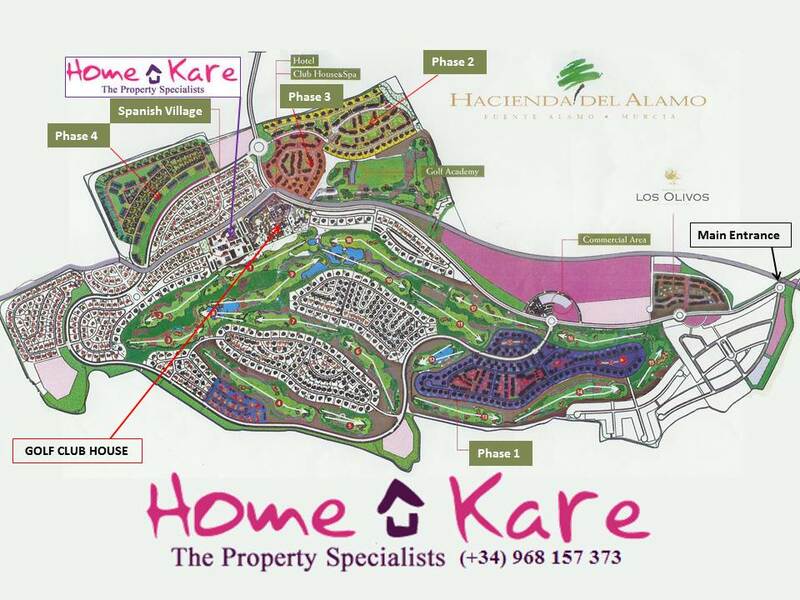 Home Kare was created for them to be able to transfer the skills and knowledge of a high level catering background into property sales and management. Taking their clients from initial viewings and through the purchase procedure to helping them to set up their new property, change utilities, furnish and maintain on a daily basis. Their office in The Spanish Village with The Resort of Hacienda del Alamo is open from Monday to Friday from 9.30 am to 6.30pm whilst Saturday's and Sundays is by appointment. Having spent the last 20 years helping people to realize their dreams, there is not much that they will not be able to advise you on or help you with, Experience is Everything!